Pearl boats sailed from Dubai, divers submerged and searched for the elusive pearls. The people of the pearl industry lived here in the Baslakiya quarter. 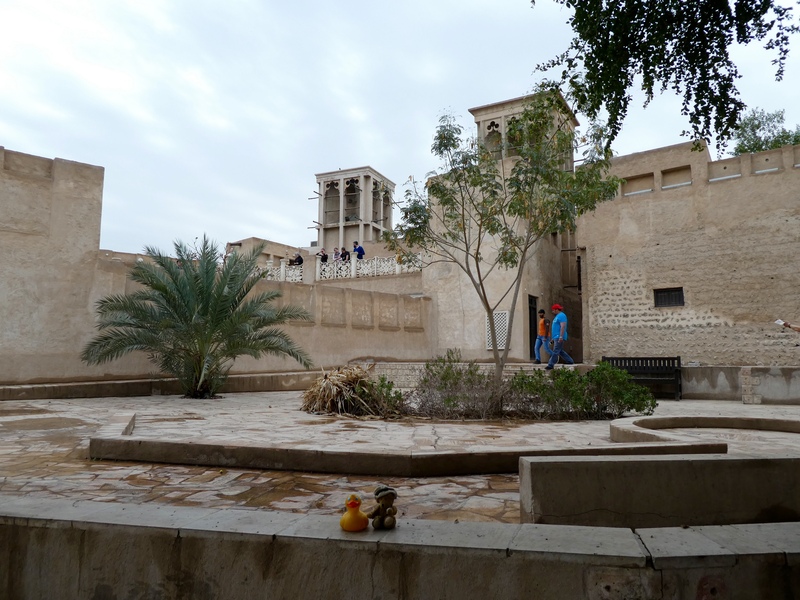 Zeb the Duck and Chanel the Bear visited this picturesque heritage area. 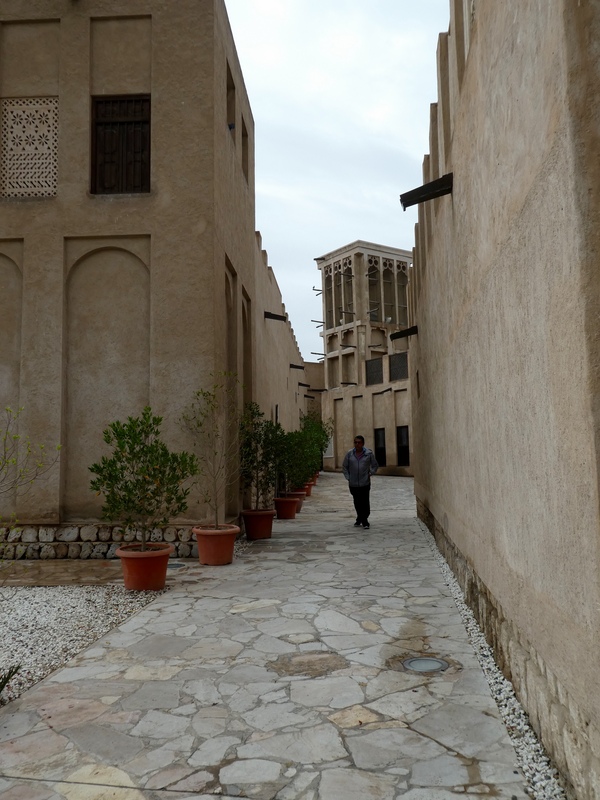 This area of Dubai was established in the late 1800’s, by pearl traders and well-to-do textile traders from Bastak, Iran. There are also many galleries and restaurants in this area, but we were eating elsewhere today. 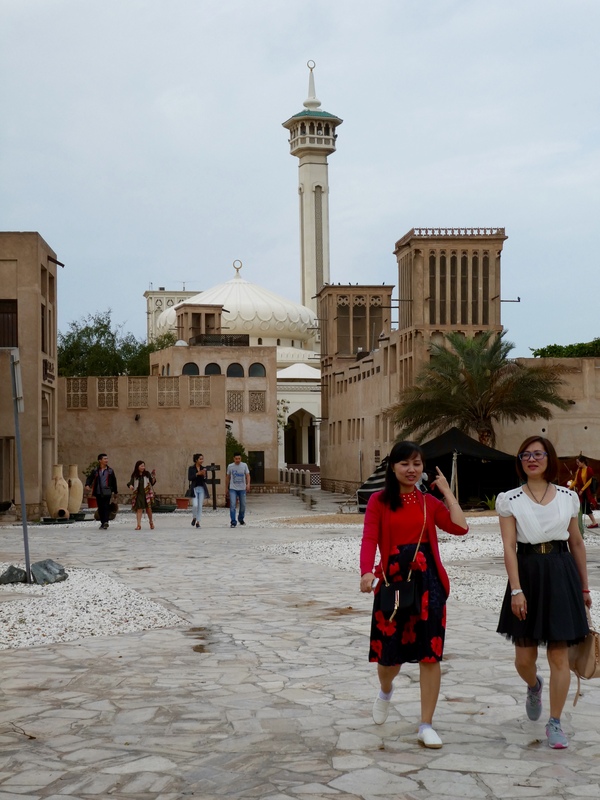 This was just a stop to explore and see old Dubai, before oil and all the oil wealth changed things. 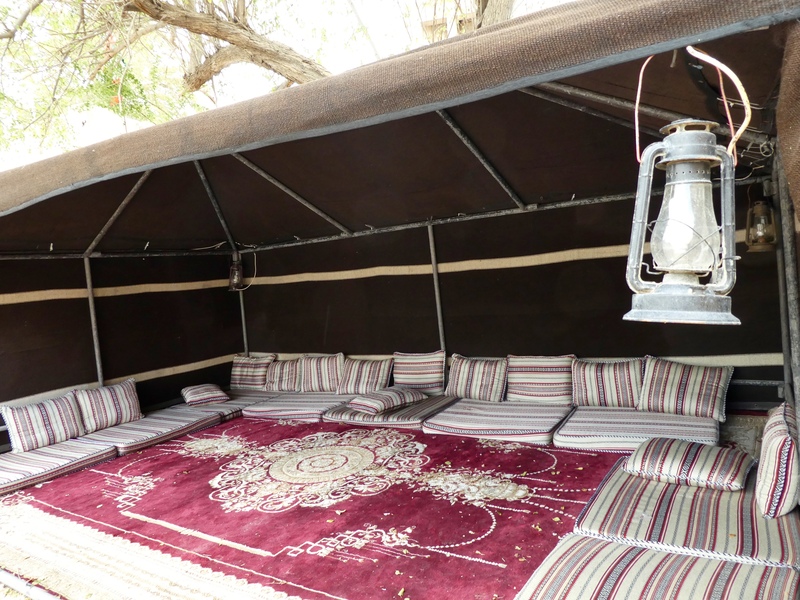 Here were learned what the inside of a Bedouin tent probably looked like. The Bedouin people are nomadic, so they need to be able to move easily. We like this tent area. We can even imagine camels nearby. 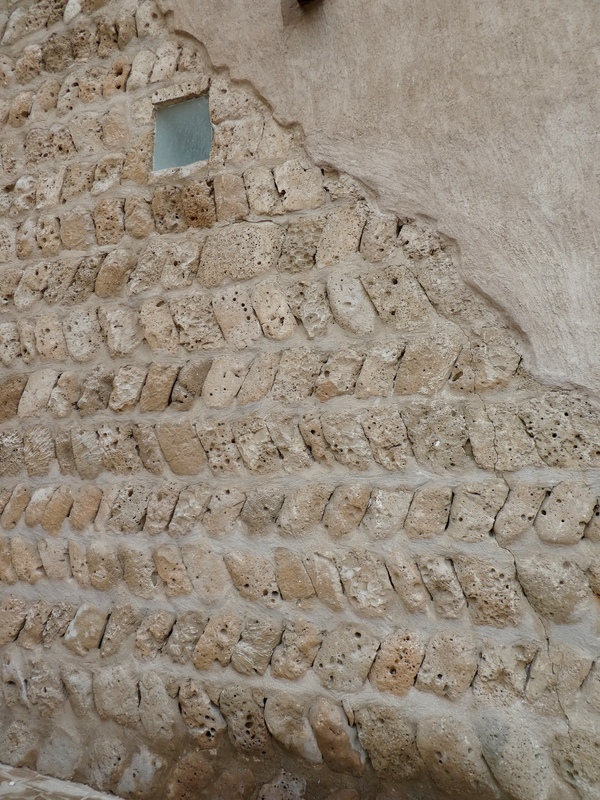 Originally the walls were built with coral. Later they were covered with plaster. Here some of the plaster has been removed and we can see the coral. We like the coral. It does get very hot here, in the desert during the summer. This, a wind tower, was the original air conditioning. The tower was open on all 4 sides. The wind came in and was forced downward. Often the open areas were covered with wet cloth. The wet air cooled the living space. This seems rather similar to some coolers, used in the United States for cooling in areas of low humidity. The buildings were tall and the walkways or alleys were narrow. This provides shade during the heat of the day. When we were there, in February, the temperatures in the 70’s and low 80’s were comfortable. According to our iphones, the temperatures are consistently in the 100’s now. Shade was be needed. 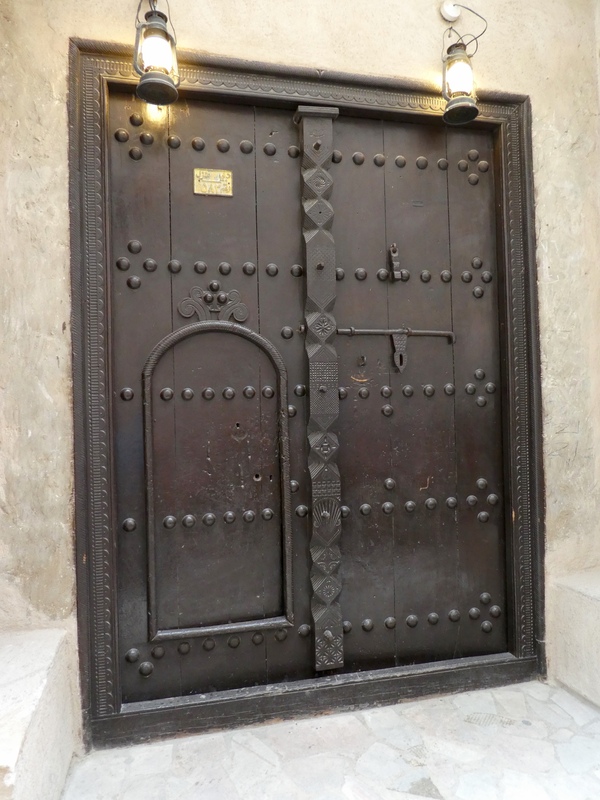 Look at these old, heavy and very ornate doors. Aren’t they wonderful? We spotted this door, partly open. 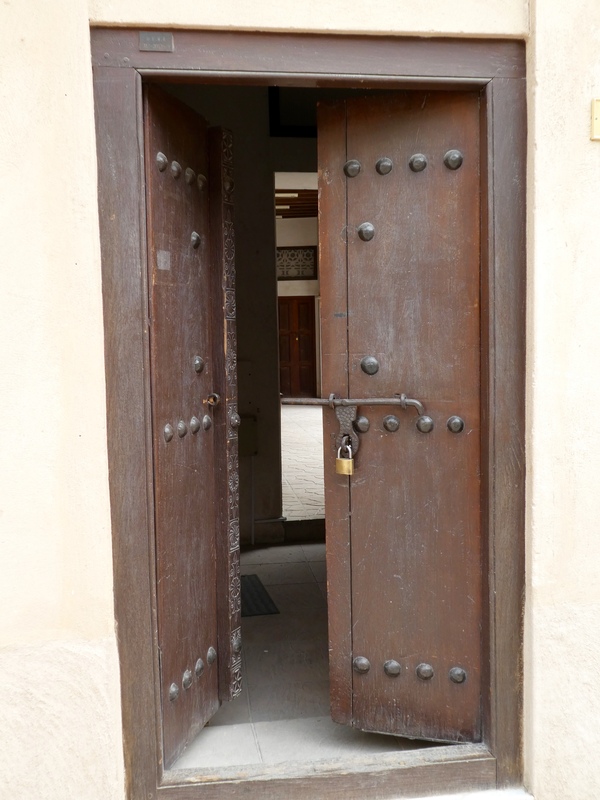 We would never go inside or even peek into someone’s home, but this shows that the homes consist of long, narrow rooms. 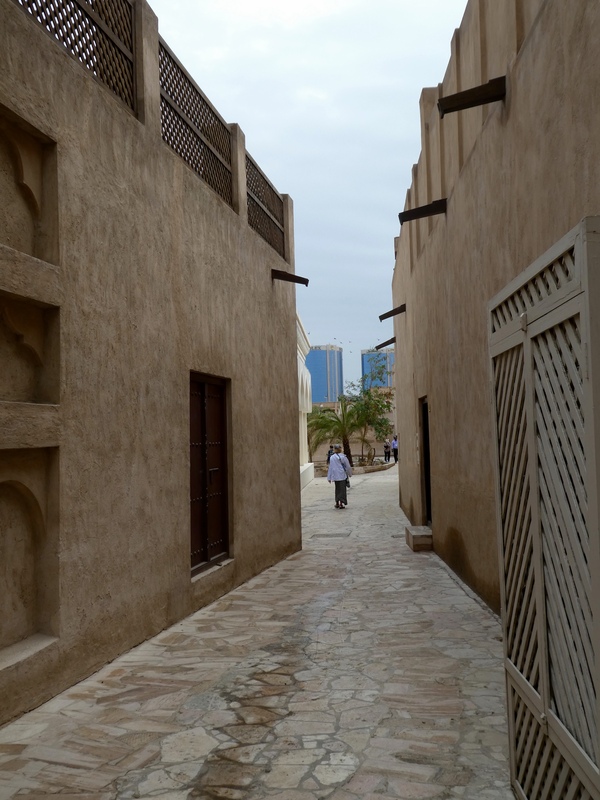 Wandering through Bastakia, looking down the narrow alleys, we see modern Dubai. What a contrast! 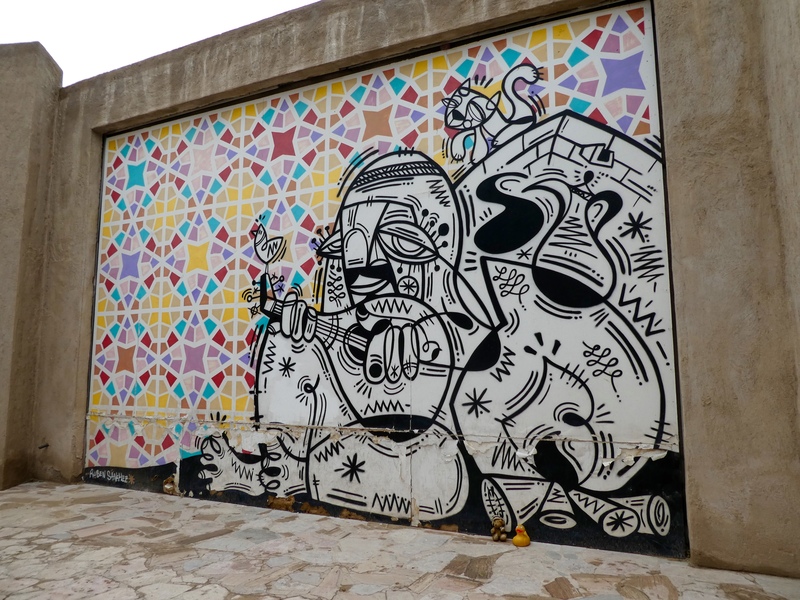 We found this mural by Ruben Sanchez. 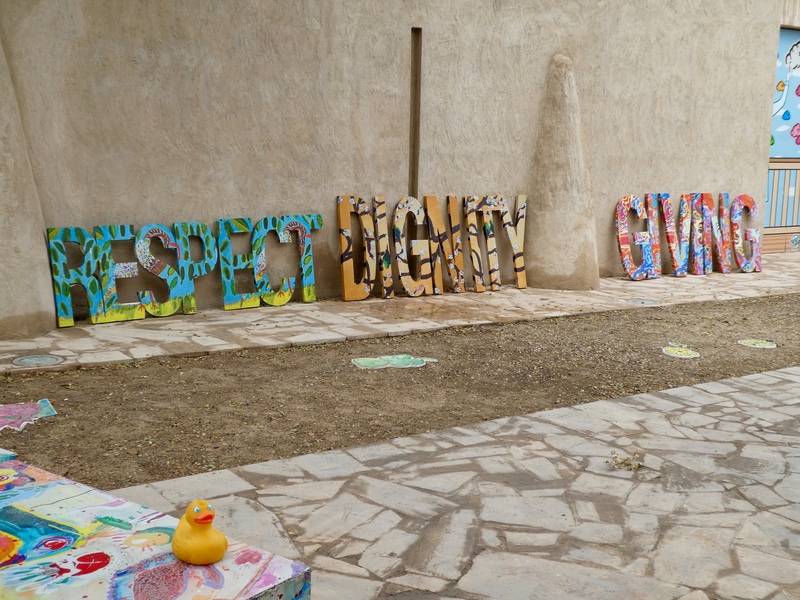 Nearby we spotted these words, Respect, Dignity and Giving. That seems to be a theme and ideal around the world. 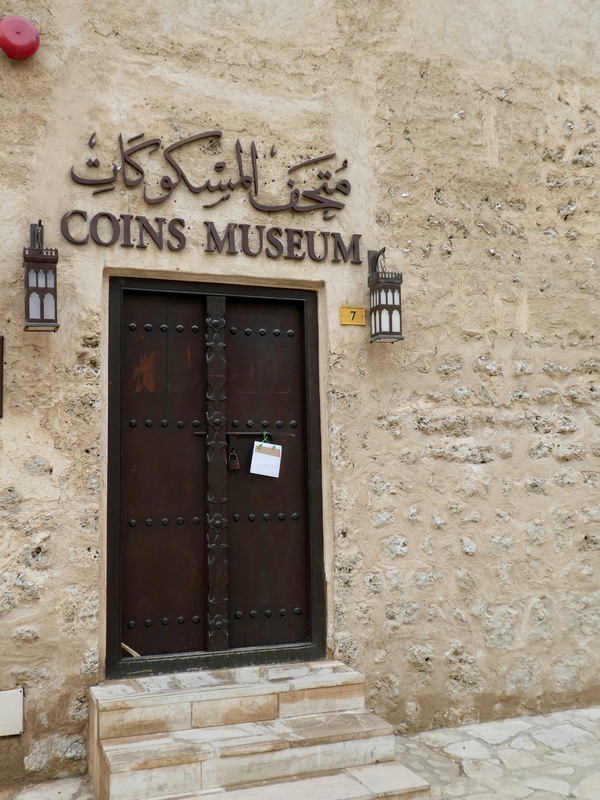 Here is the coin museum. It was closed, but this old building became the coin museum in 2004. It houses over 470 rare coins. It is believed that some of the coins are from the time of Mohammad. Chanel and I liked this resting place, so we decided to rest. This is lovely and peaceful. You will notice that Dubai Creek, a main waterway through the city is right here, by Bastakia. Dubai Creek is right here. 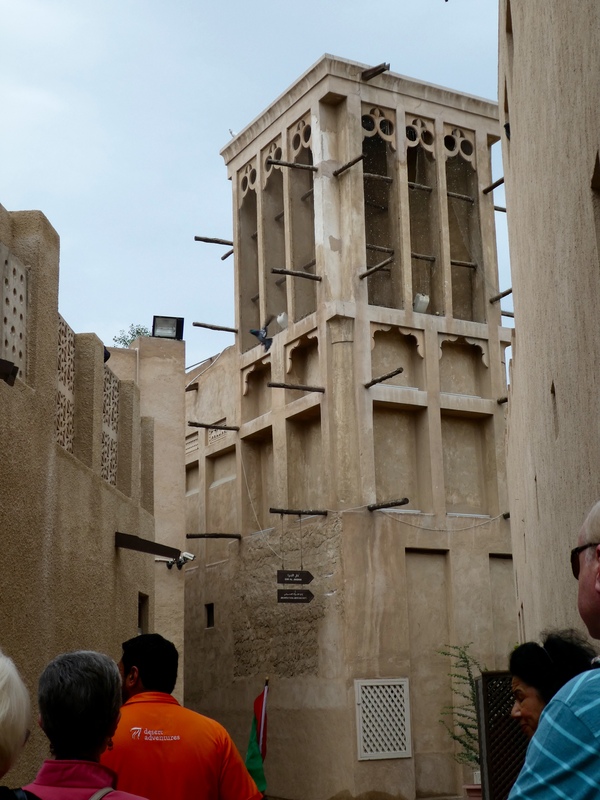 Our guide, Tariq, says it is time to get back on the bus and see something else in Dubai. I wonder we will go next. 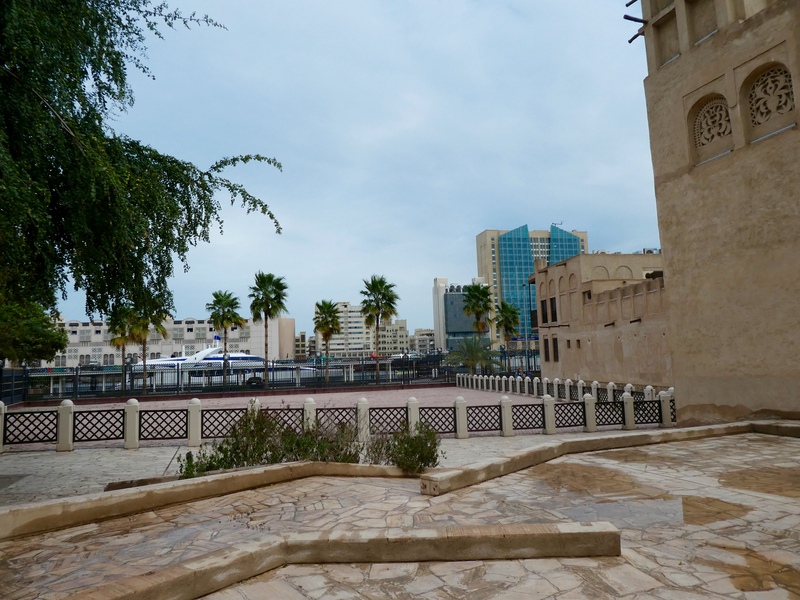 This entry was posted in Dubai, Uncategorized and tagged Bastakia Heritage Area, Coins Museum, Colorado Traveling Ducks, coral walls, Dubai Creek, United Arab Emirates, wind tower. Bookmark the permalink. How interesting to see the old part of the city. It was good. With so much of “worlds biggest” etc it was nice to see life before oil and the incredible oil wealth. Great post! This is the the Dubai I’d like to see. To me, it’s much more interesting than all the skyscrapers and extravagance.